Bioshock has risen from the depths to deliver one of the most surreal and extraordinary gaming experiences in years and is truly a classic in the making. There are so many games out there that could be considered classics. Games that redefined certain genres or influenced countless spin-offs and remakes. Games that gave the player a once in a lifetime experience and one that they surely will not forget about for a long time. Those games come and go and most of them take years before they resurface again. Luckily enough Bioshock has risen from the depths to deliver one of the most surreal and extraordinary gaming experiences in years. 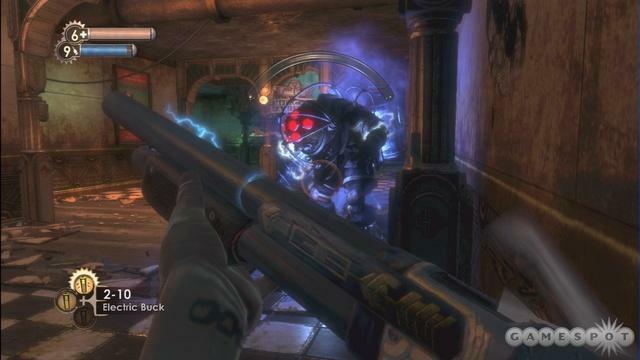 Bioshock is unlike any other, and it's a classic in the making. 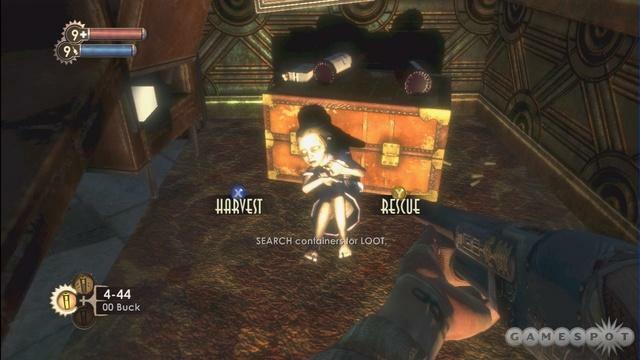 What makes Bioshock so exhilarating is the captivating setting in which the game takes place. Set in the 1960's amidst war and conflict, a lone survivor of a plane crash soon finds himself stranded on a island inhabited by a single lighthouse. Inside the lighthouse is an underwater elevator which takes him to the city of Rapture, an underwater Utopia that gave its citizens freedom over government, control, and persecution. But like all Utopias, things start going terrible wrong down in Rapture and the once beautiful dreamland has turned into a nightmarish warzone full of genetic freaks and psycho machines. This is where your adventure in Bioshock begins. The story revolves around a tycoon named Andrew Ryan who planned and built Rapture. After witnessing his baby crumble to pieces he soon becomes deranged and demented at the fact of what it has become. A man named Atlas greets you as you leave the elevator and soon informs you that he is trapped and needs you to get extra powerful in order to save him. Roaming around the world of Rapture are giant machine-like creature called Big Daddies who guard and protect young girls called Little Sisters who carry around a needle draining ADAM from dead people. This ADAM is highly sought after and everyone wants it, so naturally the Little Sisters are under constant guard. Tenenbaum, a scientist who helped create the Little Sisters also talks to you throughout the campaign alerting you to save the girls roaming around the world. Depending on what you choose to do with effect the story and the situations throughout the game. From the moment you step inside the lighthouse to the moment the game ends almost every single location in the game will take your breath away. A sign inside the lighthouse read "No Gods or Kings, Only Men," which epitomes the conflict for which you will soon become a part of. Mortality was not an option down in Rapture and everyone did what he or she could in order to become the ultimate, powerful citizen. Because everyone in Rapture has become mutated by injecting too much plasmids and tonics into their system, the overall effect feels like a giant war. Everybody is fighting everything and there are literally no sides in this gigantic underwater world. Enemies will attack each other and not follow any scripted events and will even go about their business like nothing happened afterwards. Its always rewarding to note that there could always be surprises around the corner as any enemy and any thing could be your own worst enemy. Rapture focused its intents on giving people freedom to become the ultimate genetic survivor in a world dominated by corruption. The décor shows all of the lush posters modeling people with special powers, called plasmids, that will let them shoot electricity out of their fingers, move objects through the air, and even freeze things instantly. The many plasmids in the game allow for a different and unique take on the simplistic shooting formula. By combining the many plasmids with the assortment of weapons the combat always feels fresh and original during every encounter. 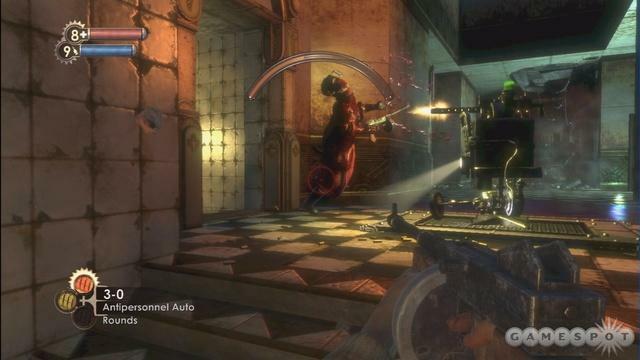 The weapons are also a welcome addition to the world of Rapture. Because the city was involved in bioengineering, many of the weapons can ultimately have special powers by the end of the game. There are your usual pistols, machine guns and shotguns, but there is also a huge assortment of spectacular new weapons like the chemical thrower, crossbow, and mine throwers that can make any confrontation enjoyable and also different. These mixed along with the plasmids can make unlimited possibilities in combat; such mixtures like freezing enemies with the plasmid and than unloading on them with shotgun blasts to the head while they cant defend themselves. Since everything is unscripted in the game besides the main story, almost anything goes in the various districts and cities. The biggest exception to this is the Big Daddy and Little Sisters wandering around each area minding their own business. As mentioned before, these two characters will simply mind their own business unless you forcefully engage in combat with them. Its at these moments you can than choose whether or not you want to take down the Daddies to acquire the ADAM within the Little Sisters. And since the Sisters are the only organisms in Rapture that carry ADAM, your actions will soon become clear when you get knocked down almost instantly by the gigantic brute. The Big Daddies are definitely a force to be reckoned with as they can charge almost across the entire screen instantly, pound you without mercy, and unleash hellfire upon you when you enrage them. Using your surroundings to your advantage is always the difference between life and death and utilizing them properly is a key aspect throughout the entire game. There are many things to look out for while venturing through Rapture. There are tons of various vending machines you can interact with offering you first aid kits, tonics, and other upgradeable things you can ultimately hack into to give you discounts. Hacking is a major part of the game as it can give you the upper hand in many different scenarios. You can hack almost anything in the game, from vending machines to turrets. Hacking vending machines give you discounts while hacking the various enemies let them fight for you. The little bots that fly around after an alarm triggers once hacked will actually follow you around and fight with you. The turrets will also shoot upon anyone but you during combat sometimes making battles a double-team affair. The instances are endless for your creativity. After taking down the Big Daddies you can choose between harvesting and saving the Little Sisters. Harvesting nets you twice as much ADAM to spend but you must witness the after effects of killing all of the little girls. Rescuing the girls only gives you half the ADAM but you get the satisfaction of knowing the girls will survive. After you gain the ADAM you can spend it at machines called Gatherer's Gardens where you can buy more slots that allow you to hold more plasmids, tonics, etc as well as new skills and items. Its definitely a morale choice to make in the game, will you be greedy and kill every Little Sister for ultimate power or will you save them all and get what you can afford. Everything in Bioshock is simply gorgeous. The locales all have special art-deco style flair and no two locations ever look the same. From the lush green dilapidated forests of Arcadia to the playworld mall-styled area of Fort Frolic, each area has its own unique and special taste to it. What makes the visuals so extraordinary is the fact the game feels almost real to the touch, every corner, room, and place is traversable and every item in the world is interactive. The water effects are also something to be noticed as they are probably the most realistic and magnificent effects I've ever seen in a game. Truly spectacular once you seem them in motion. Bioshock is truly a classic in the making. From the moment you step out of the elevator you will be entered in a world you never want to end. Its superb combat and amazing plasmid innovations only encourage you to continue playing for more ways to utilize them. The spectacular story will have you drawn in from the start and will keep you hooked and guessing to the very end. It's a game not to be missed by anyone and one that many games will soon imitate in the future. 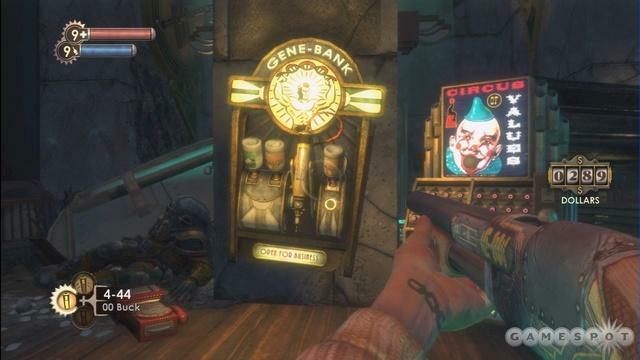 Play Bioshock.